Wales scrum-half Rhys Webb backed up his mid-week words with his display against the All Blacks on Saturday. We analyse an excellent all-round performance. “They are a world-class team, but I think they are to be taken as well. They’ve been getting a bit flustered when people have been going at them” – Wales scrum-half Rhys Webb. It was hardly trash talk in the same league as boxing’s biggest bad-mouths, but Webb’s comments last week drew grins and groans in equal measure. Some were encouraged by the spiky confidence of a player in the form of his life. Others labelled the sentiments as pure naivety on the part of a seven-cap 25 year-old who had never before faced New Zealand, yet still saw it fit to poke the All Black bear. Whatever your stance on his provocative preview, it is hard to disagree that Webb fully vindicated it. 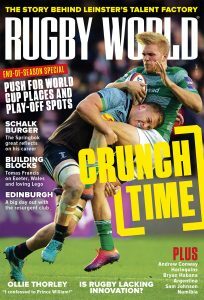 When he left the field on 56 minutes with a groin twinge – something Rob Howley is hopeful he will recover from in time to face South Africa this weekend – Wales were leading 13-10. It was a winning situation, and Webb’s inspiring performance had been instrumental. Here is a run-down of how he excelled across the board. The keys to kicking from hand, especially against the phenomenal All Blacks back three, are accuracy and decisiveness. Either the ball must be sent back over their heads or close enough for chasers to contest. Anywhere in between and the likes of Julian Savea and Ben Smith will run riot. Unable to send it straight into touch as the lineout is outside the 22, Webb must keep the ball within the field of play. He does so, and the sheer length of the kick means Smith must adjust. James’ presence also makes the ruck longer, which simply increases the difference between the ball and the offside night line means Retallick needs to stay further away Webb. Therefore, he has longer to make the desired connection. If this was off the cuff, Webb was also an important part of Shaun Edwards’ structure. In the Welsh defensive system, which for so many years has benefitted from the 104-kilogram frame of Mike Phillips, the scrum-half usually stands in the line rather than sweeps in behind. They say defence is a mind-set. That is difficult to argue with – bloody-minded determination does go a long way. Seconds after this screenshot, Beauden Barrett pounced on the loose ball, turned and tore through. This is a short clip, but sufficient to show the range and sharpness of Webb’s distribution throughout the game. Over his 56 minutes on the field, he passed the ball 31 times and rarely stalled the momentum of Wales’ runners. While Wales could not capitalise on the break as Roberts’ attempted offload went awry in midfield, the All Blacks did not keep Webb out later in the piece. Seeing Webb translate domestic prowess onto the Test stage this autumn has been so refreshing. It would be such a shame if injury prevented him a chance to take on the Springboks. Even so, he has surely done enough to cement his standing as the number one scrum-half in Wales up to 2015 and beyond.